Are you looking for the spray gun that make your painting task easy and friendly, then I must say that here you will get the satisfactory result to your search? In this post, you will be served with amazing products that will provide significant relief to the all automobiles and General Industries. 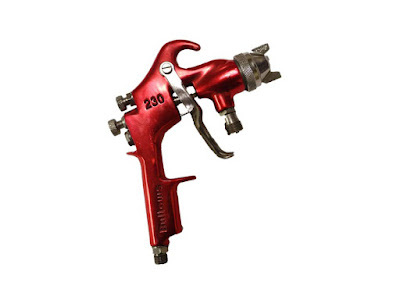 Bullows 630 Gravity Feed Gun have a Light weight and Slim Body Spray Gun. It has a Good Strength and Durability due to Forged Aluminium Gun Body.Special Maintenance kit is provided with each gun. P.T.F.E packing for extended work life.Needle available in nylon and SS. Bullows 230 Gravity Feed Gun will make your task of painting smooth and comfortable. You can provide beauty to your objects without any disorder.Enhance the look of your objects by making use of above valuable product so that eventually you can enjoy the beautiful A Class finish.Transfer Efficiency rate of bullows 230 gun is 30% to 35% because of its transfer efficiency rate it reduce wastage of paint. Bullows is known for its system excellence in terms of quality, innovation and customization. We have extended our wings & specialized ourselves into Spray Painting Solutions & pre-treatment systems & solutions with help & support from our associate concern M/s Triologics Surface Coating Private Limited. Bullows had pioneered spray painting technology in India, from conceptualization to application, for achieving best surface finish, fast productivity and in compliance with environmental protection norms, keeping operator safety at prime focus. 8. Paint Circulation System with Paint Kitchen. In recent years Bullows have also established name in providing total turnkey solutions (manual / automatic) to various industrial applications which starts from last activity of manufacturing to first activity of packing (pre-treatement process + painting process + loading / unloading). For any enquiry related to Spray Painting System, email us at sales@bullows.com or call us at +91 8433930782.